in the Legislative Assembly of Assiniboia by Hon. Louis Lacerte and Hon. Pierre Delorme. The name Point Coupée/ Cut Point was given to a distinct bend in the Red River where it passed through low-lying land, nine miles south of where the Rivière Sale emptied into the Red. By some accounts the bend was so called because travellers on the Pembina Trail were often cut off by spring floodwaters at this location. 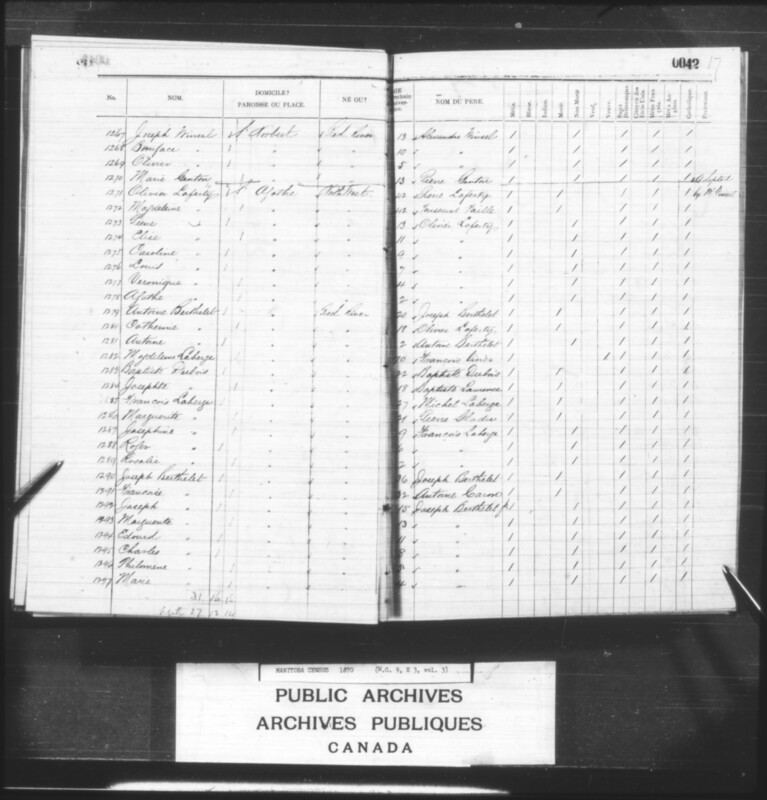 For many years Pointe Coupée was considered to be part of the ecclesiastical parish of St. Norbert — although the Catholic Church established a separate mission among the Métis settlers of the area in 1857. 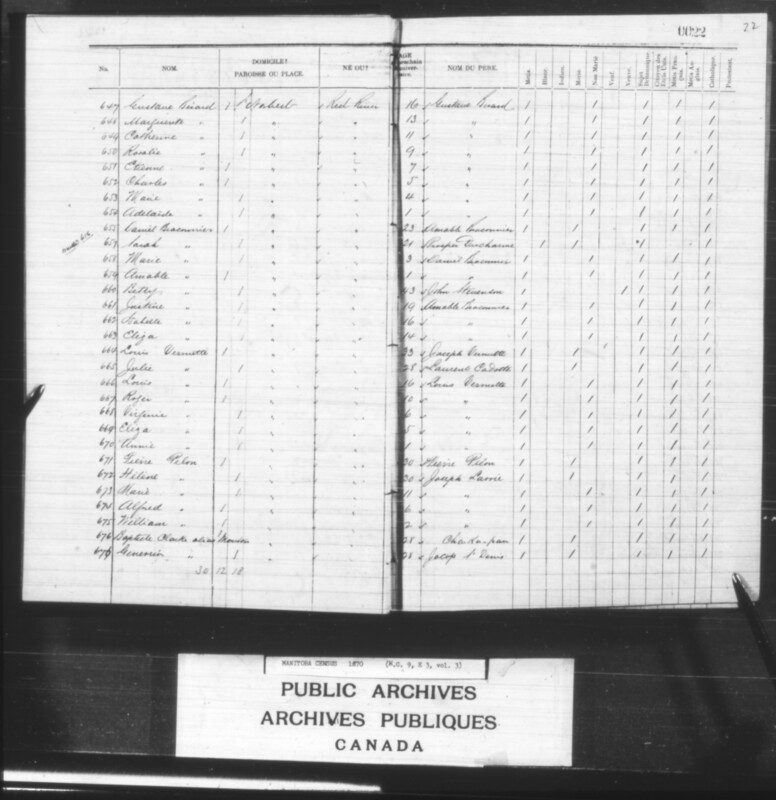 In June of 1869, Canadian members of John Allan Snow ‘s road building crew (Snow was absent from the settlement at the time, seeking funding), began putting in survey posts/ claim stakes, cutting wood to build a house, and digging a well at Pointe Coupée — without inquiring about the customary usage of land in the area or the procedures followed before occupying property. This alarmed local residents, who regarded the land being staked as already owned or spoken-for. In July, a meeting was held at St. Norbert Church and the settlers created a system of mounted patrols to police the upper settlement and prevent incursions by newcomers on lands that previous settlers regarded as their own. 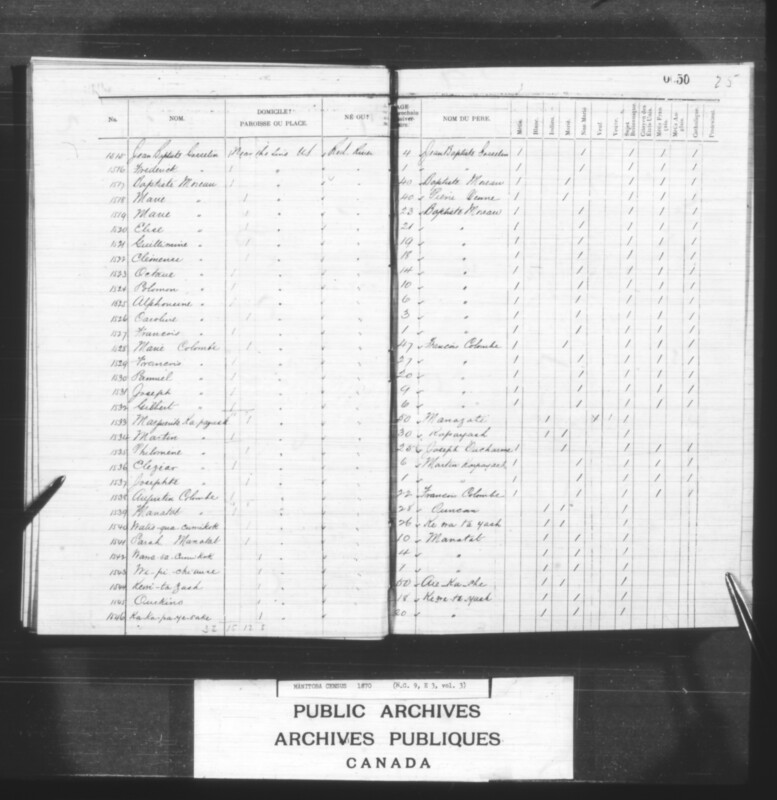 The patrol pulled out the Canadians’ stakes at Pointe Coupée, scattered the house timbers, and filled in the well. 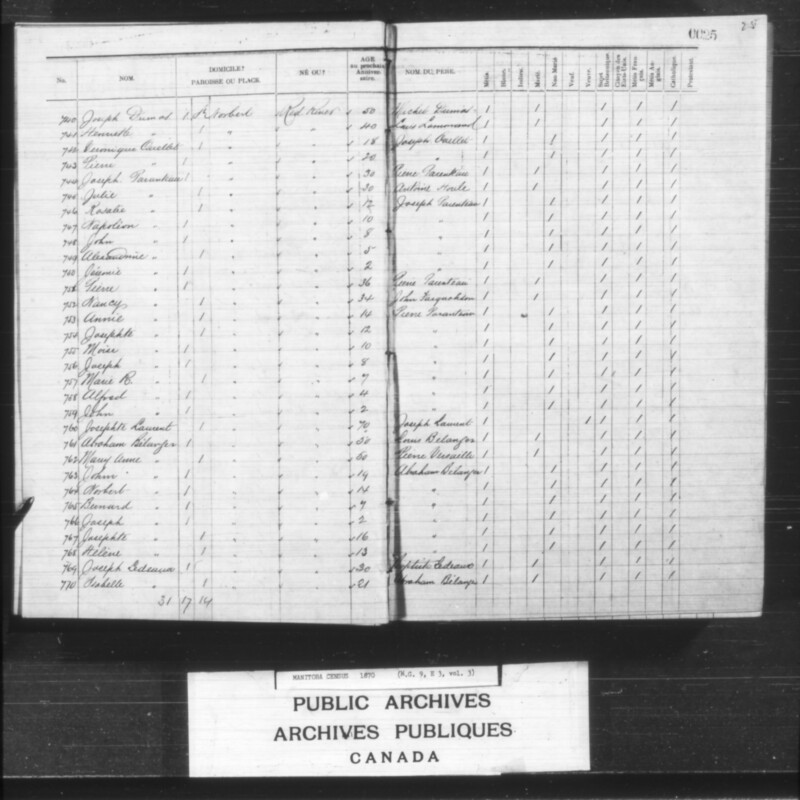 Point Coupée was a separate electoral riding during the Resistance of 1870, but was enumerated as part of St. Norbert in the Archibald census of October 1870, which makes it difficult to determine where to place people with any certainty. Based on a map drawn by J.A.U. Beaudry in 1871, it seems reasonable to assume the electoral boundary between Pointe Coupée and St. Norbert (south) fell somewhere to the north of the home of William Dease. The electoral riding extended south all the way to the border with the United States. 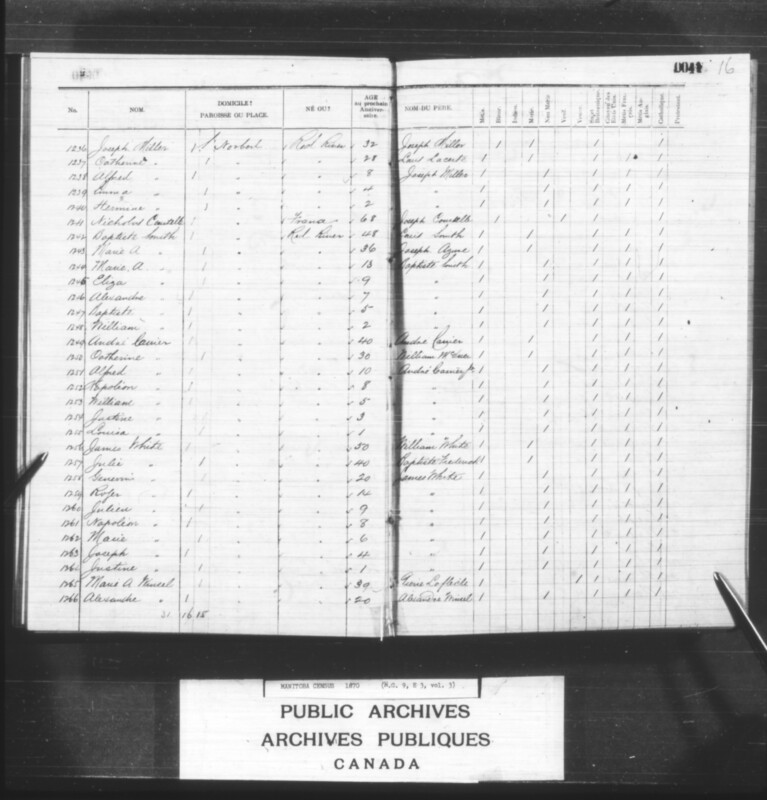 Thus, the riding of Pointe Coupée included: residents of Pointe-à-Grouette/ Grouette’s Point at another bend in the Red River — the name suggesting members of the Grouette/ Gruette/ Gruet fur-trade family were the first settlers; residents of an ‘Indian settlement’ at See-bos-qui-tan/ The Rapids on the Roseau River/ River of Willows; and residents of or near the Hudson’s Bay Company post just north of the international boundary with the United States (with the American settlement at Pembina just to the south). At the time, Archibald considered the First Nations as sovereign. 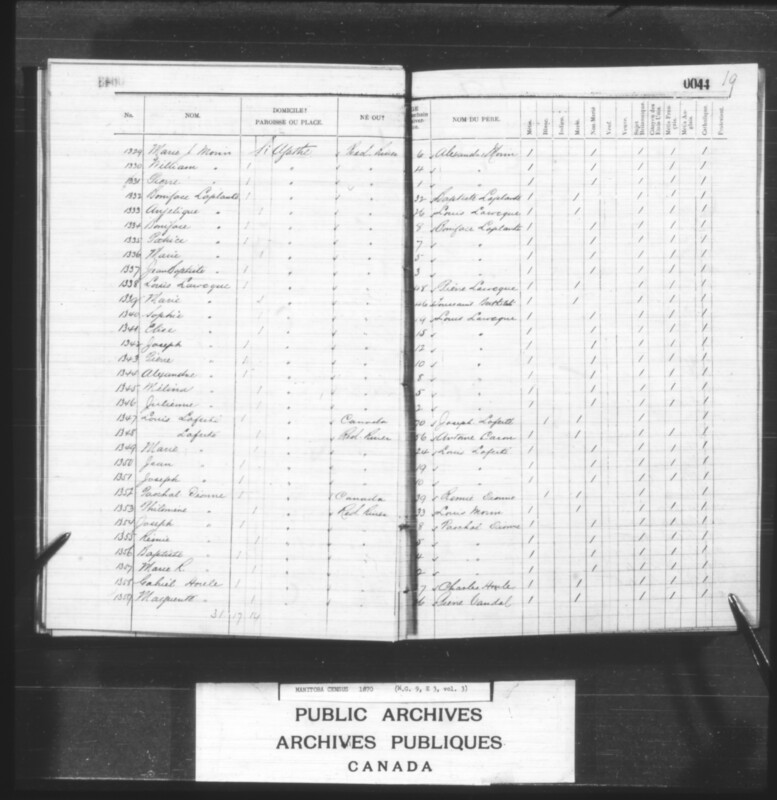 Until they agreed to enter a treaty with Canada, their lands could not be counted as co-extensive with the Red River Settlement or as available for settlement by outsiders (though newcomer Canadians had staked claims on unceded lands as early as 1868). 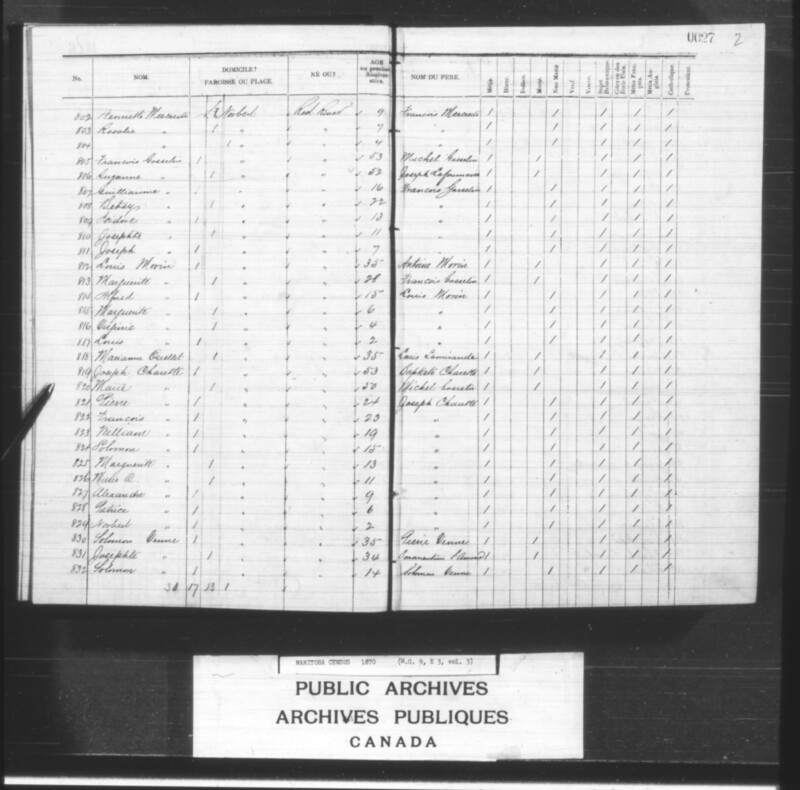 The names of Fort Garry and Pembina/ Roseau River people were listed, however, in the Treaty 1 Paysheet of 1875 (though in most instances only the male head of a family was named with wives and children mainly anonymous). 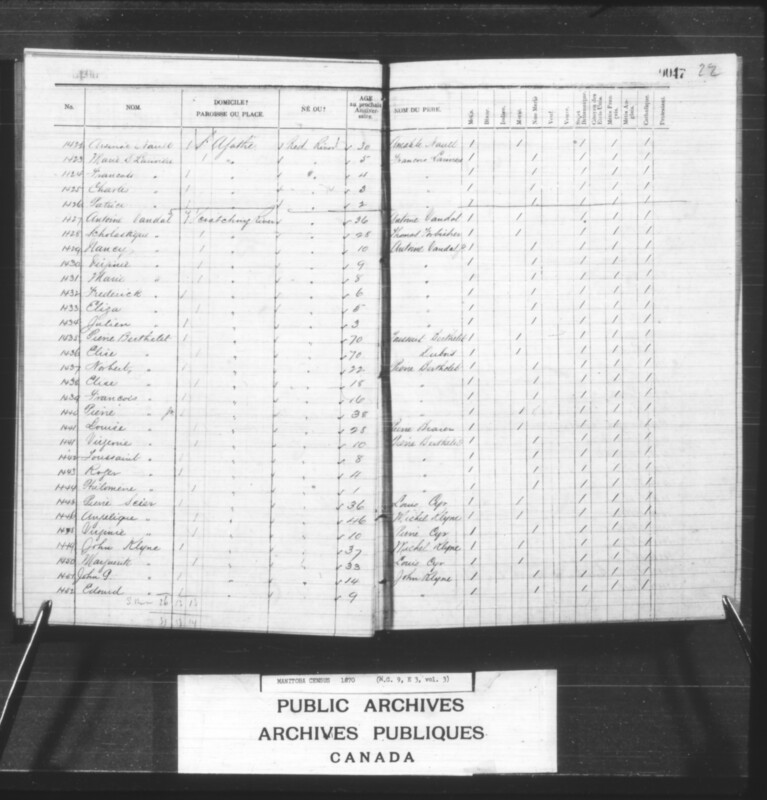 The Treaty 1 names are included below under a separate heading, to give an indication of the number of First Nations people to whom Pointe Coupée was home. 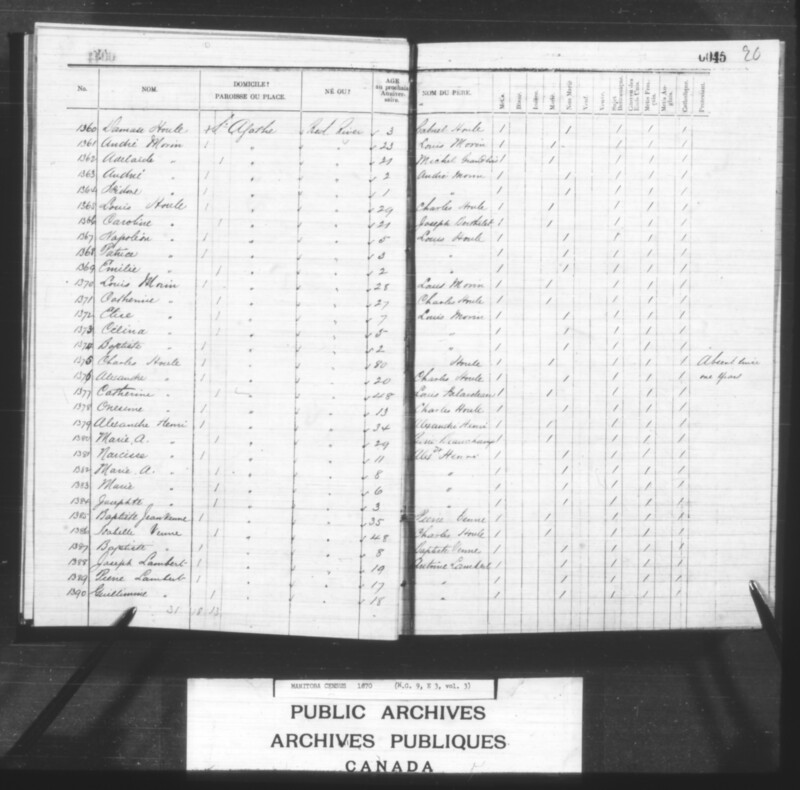 [See Town of Winnipeg, this site, for names from the Fort Garry Band]). The settlement at Pointe Coupée became known as St. Adolphe some time after the creation of Manitoba. A Catholic church of that name was constructed there in 1896 (one story credits Rev. Nöel-Joseph Ritchot with selecting the name; local lore suggests there was a desire to honour Adolphe Turner, who raised a considerable sum to help build the church). – [1206-1212] Magdeleine 19, Marguerite 16, Cleophas/ Cleophée 12, Josephte 9, Genevieve 7, Adelaide 4/ 5, Hermine/ Henri 1/ 2. – [1218-1219] Guillaume 3/ 4, Marie 2. – [1222-1225] Marie 10, Angele 7, Virginie 5, Raphael 2. 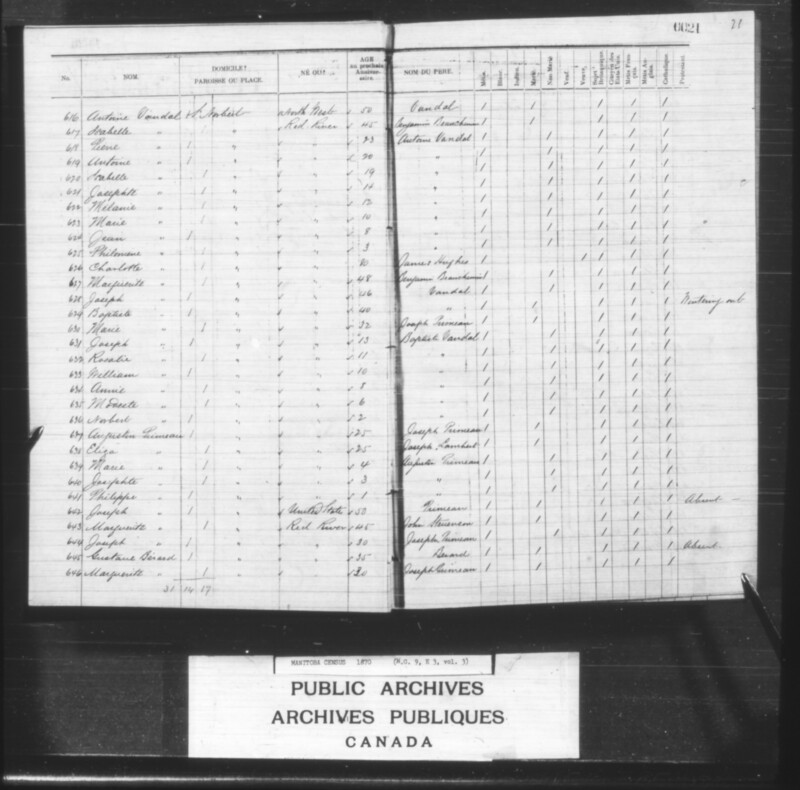 – [1158-1165] Marguerite 15, Marie 13, Francis 12, Rosalie 11, Elise 10, Isabelle 7, Josephte 5, Isadore 2. – [1228-1232] Eliza 20, Marguerite 17, Virginie 14, Alfred 13, Nelson 5. Possible Objector to a Provisional Government, 29 Nov. 1869; see also “William Dei Gratia Regem” New Nation (11 February 1870); “William Le Roi. Le Roi est mort; vive le Roi,” New Nation (18 February 1870); and “A Slight Difference,” New Nation (4 March 1870). – [1244-1248] Marie A. 13, Eliza 9, Alexandre 7, Baptiste 5, William 2. – [1199-1203] Adelaide 16, Pierre 14, Celina 12, Patrice 5, Alfred 2. – [1195-1196] Eliza 2, Marie 1. By 1872 the family was at Wood Mountain. 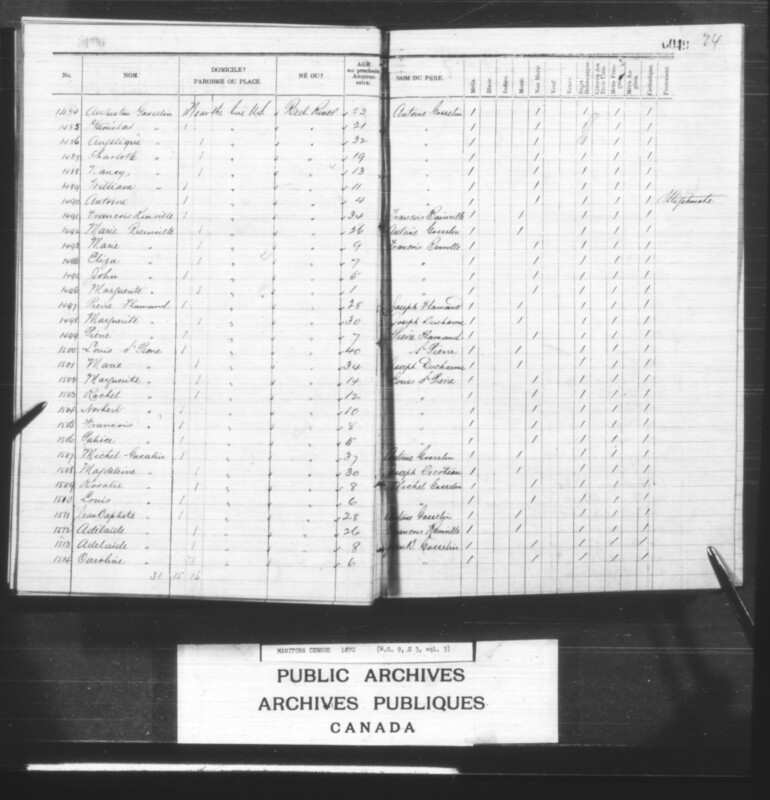 See also genealogy, which states “He witnessed the letter of Louis Riel on 20 August 1880 Montna (Misc. Papers. 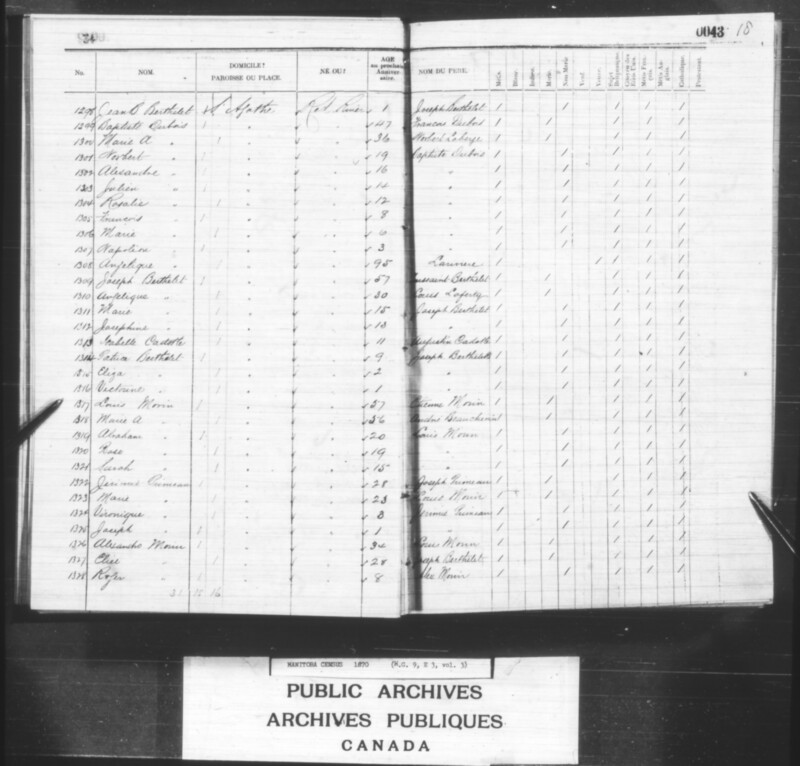 PAM, MG 3 D 1, 390, petition written by Louis Riel,” and that the family moved to Turtle Mountain, Dakota Territory U.S. by 1884, where they became classed as Chippewa. – [1188-1192] Patrice 12, Marguerite 11, William 5/ 8, Laura 6, Alexandre 3. 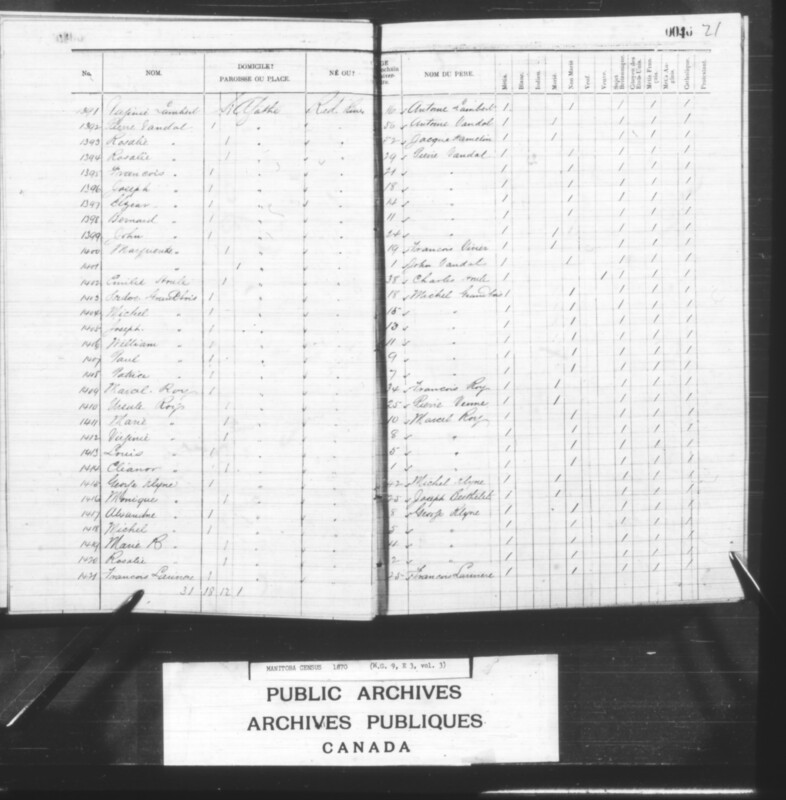 NB: William’s scrip indicates he was afterwards adopted by his uncle Bernard Beriault (born 1853; lot 22 St. Norbert). 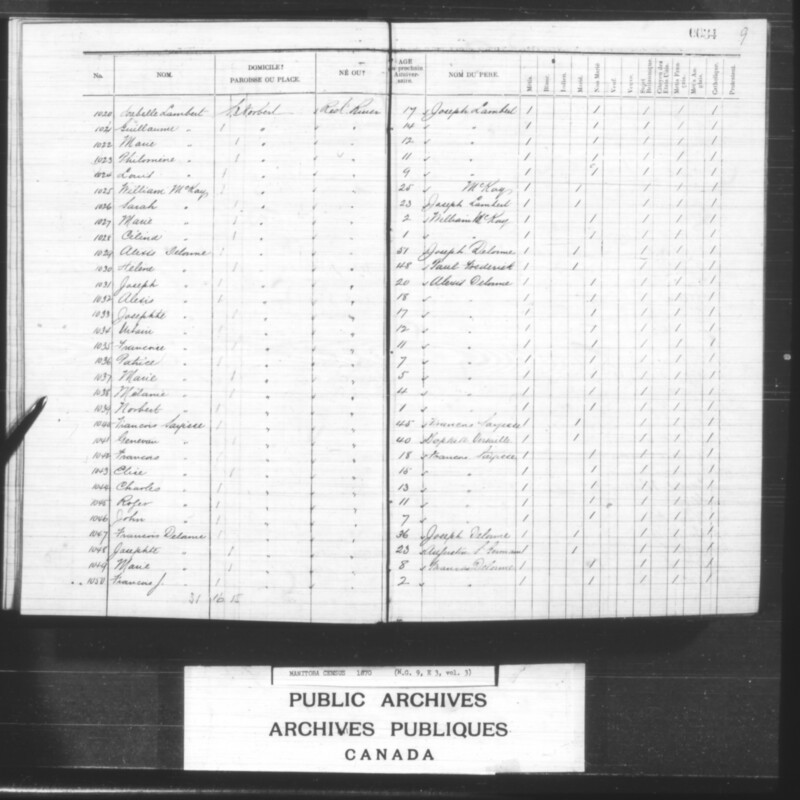 Scholastique apparently applied for scrip in the name of another child, Severe Parenteau (born 1865). – [1184-1186] Bruneau [sic: Bernard] 18, Eliza 16, Joachim 14. – [1238-1240] Alfred 8, Emma 4, Hermine 2. –  Marie 26,  [Hon.?] Louis Lacerte 24 [Buffalo hunter, with river lot at Point-a-Grouette, see below], [1172-1174] Josephte 22, Octavi 16, Isabelle 15, [1175-1181] Pierre 13, Joseph 12, Marie M. 9, Alphonsine 5, Christine 3, Justine 3, Marie L. 1. 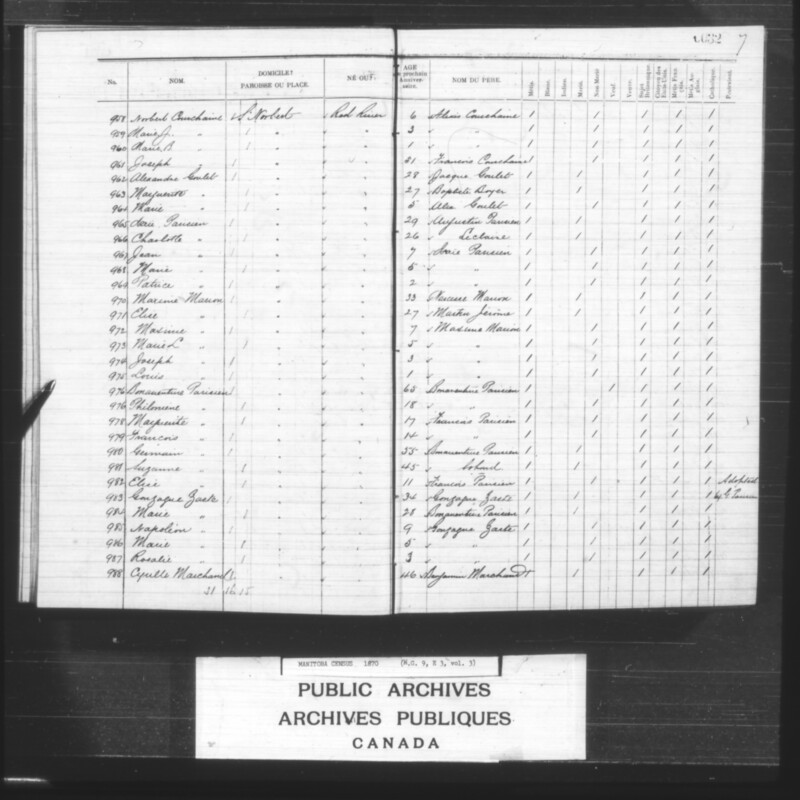 Either the father or son named Louis Lacerte could have been the honourable member of the Legislative Assembly of Assiniboia. 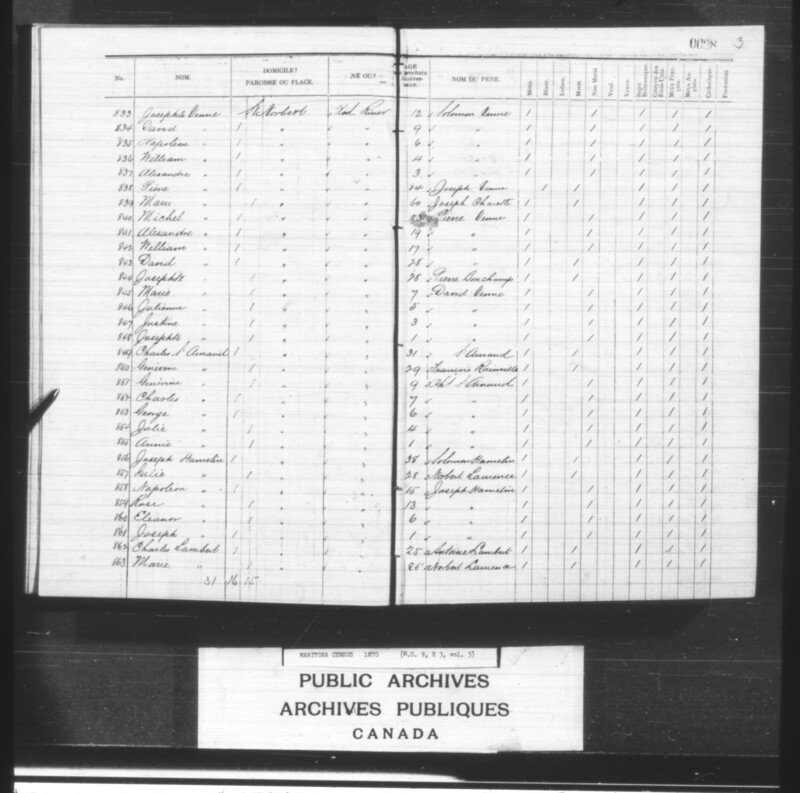 The son is perhaps a better candidate in that he was a property owner in Point-à-Grouette (the electoral riding represented by Lacerte), and conceivably resided there during the Resistance of 1869-1870. – [1151-1153] Jean Baptiste 4, Joseph 4, Moise 2. –  William 19, [1113-1114] Cecile 17, Napoleon 13, Maxime 9, Sarah 7, Charles 5, Baptiste 2. – [1121-1124] Betsy 13, Marie 10, Joseph 7, Damace 4. – [1127-1128] Elise 8, Marianne 5, Therese 3, Marie J. 1. – [1135-1138] John 10, Charles 7, Eliza 4, Pierre 1. – [1144-1145] Julie 18, Marie A. 15, [1141-1143] William 12, Baptiste 11, Joseph 7. – [1099-1103] Pierre 10, Marie 9, Louis 8, Joseph 4, Virginie 1. – [1089-1094] Caroline 17, Anaclet 12, Marguerite 8, Joseph 5, Judith 3, Marie J. 1. – [1085-1086] Elise 3, Colin 1. – [1077-1081] Marie R. 12, Louise A. 11, Joseph E. 9, William G. 6, Jule 3. 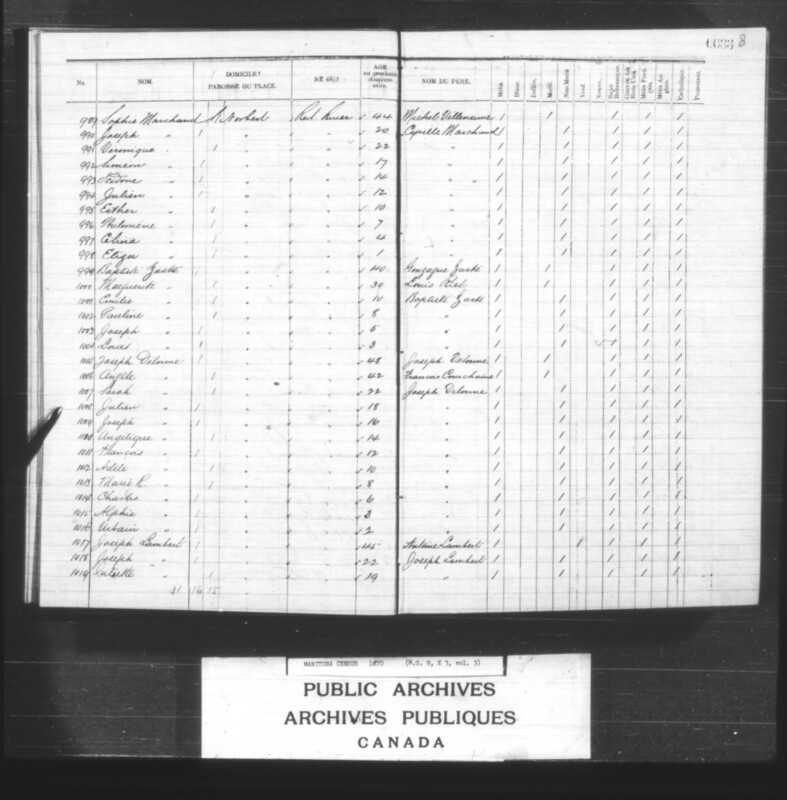 –  Gregoire Frederick 5 (Métis, son of Louis Frederick and an unidentified woman. – [1061-1067] Baptiste 20, Rosalie 15, Celina 10, Marguerite 8, Marie R. 6, Julien 3, Virginie 1. – [1042-1046] Francois 18, Elise 15, Charles 13, Roger 11, John 7. – [1049-1050] Marie 8, Francois J. 2,  Josephte 1. – [1031-1039] Joseph 20, Alexis 18, Josephte 17, Urbain 12, Francois 11, Patrice 7, Marie 5, Melanie 4, Norbert 1. – [1027-1028] Marie 2, Celina 1. – [1018-1019] Joseph 22, Juliette 19, [1020-1024] Isabelle 17, Guillaume 14, Marie 12, Philomene 11, Louis 9. – [1007-1016] Sarah 22, Julien 18, Joseph 16, Angelique 14, Francois 12, Adele 10, Marie R. 8, Charles 6, Alphie 3, Urbain 2. – [1001-1004] Emilie 10, Pauline 8, Joseph 5, Louis 3. – [985-987] Napoleon 9, Marie 5, Rosalie 3. – [990-998] Veronique 22, Joseph 20, Simeon 17, Isadore 14, Julien 12, Esther 10, Philomene 7, Celina 4, Eliza 1. 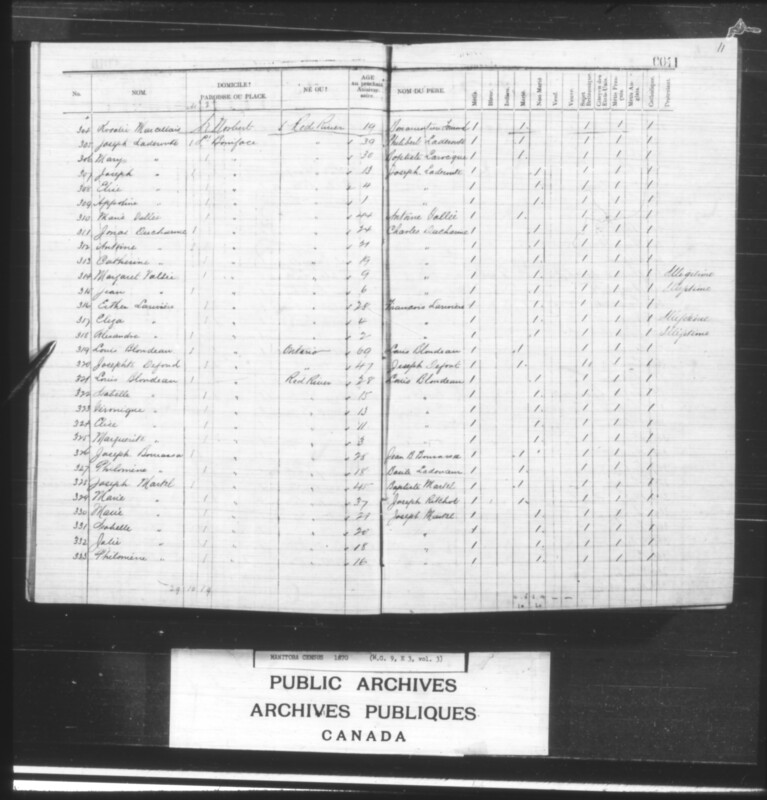 Bonaventure Parisien (Métis, born 1800/ 1805/ 1808 to Claude Bonaventure ‘Bonvan’ Parisien Sr. and Isabelle ‘Lizette’ [Saulteaux]; died 1873/ 1874), married Marguerite (Saulteaux, born 1810 at Red Lake; died 1845). – [972-975] Maxime 7, Marie L. 5, Joseph 3, Louis 1. – [956-957] Joseph 13, Francois 10, [958-960] Norbert 6, Marie J. 3, Marie B. 1. – [947-953] Maurice 14, Roger 12, Louis 10, Alexandre 8, Marie 7, Justine 4, Napoleon 1. – [942-944] Marie 10, Josephte 5, Cecile 2. – [938-939] Julien 3, Alfred 1. – [851-855] Genevieve 9, Charles 7, George 6, Julie 4, Annie 1. – [931-935] Antoine 10, Joseph 6, Marie 5, Alexandre 3, Rosalie 1. [922-926] Brigitte 17, Francoise 15, Baptiste 11, Marie 9, Norbert 5, [927-928] Julie 3, Rose 1. – [916-919] Baptiste 26, Michel 22, Paul 19, Cuthbert 13. – [904-909] Louison 12, Urbain 10, Marie 9, Elize 8, Magloire 5, Elzear 2. – [898-900] Catherine 6, Jean Baptiste 5, Joseph 2. – [888-895] Caroline 25, Francois 22, Elmire/ Elmise 20, Joseph 17, Roger 13, Marie 11, Rosalie 8, Elise 7. – [858-861] Napoleon 15, Rose 13, Eleonor 6, Joseph 1. – [845-848] Marie 7, Julienne 5, Justine 3, Josephte 1. – [840-842] Michel 23, Alexandre 19, William 17. – [877-882] George 14, Josephine 12, Alvina 11, Alfred 6, Wilfrid 4, Mary 2. –  Solomon 14, [833-837] Josephte 12, David 9, Napoleon 6, William 4, Alexandre 3. – [814-817] Alfred 14, Marguerite 6, Virginie 4, Louis 2. – [821-829] Pierre 24, Francois 23, William 19, Solomon 15, Marguerite 13, Marie 11, Alexandre 9, Patrice 6, Norbert 2. – [807-811] Betsy 22, Guillaume 16, Isidore 13, Josephte 11, Joseph 7. – [800-802] Sophie 15, Francois 15, Marguerite 11, [802-804] Henrietta 9, Rosalie 7, [?] 4. – [792-797] Marie 12, Louis 10, Joseph A. 8, Alexis 6, Angelique 4, Virginie 2. – [774-779] Charles 21, Emerance 19, St Pierre 18, Marie 9, William 8, Elzear 5. – [763-768] John 19, Josephte 16, Norbert 14, Helene 13, Bernard 7, Joseph 2. – [753-759] Annie 14, Josephte 12, Moise 10, Joseph 8, Marie R. 7, Alfred 4, John 2. – [746-750] Rosalie 12, Napoleon 10, John 8, Alexandrine 5, Jeremie 2. – [783-786] Marie Ann 10, Marie 7, Daniel 6, Helene 4. – [731-739] David 23, Daniel 21, Cecile 18, Angele 15, LaRose 13, Dumas 10, Didyme 7, Marie L. 5, Clarice 2. 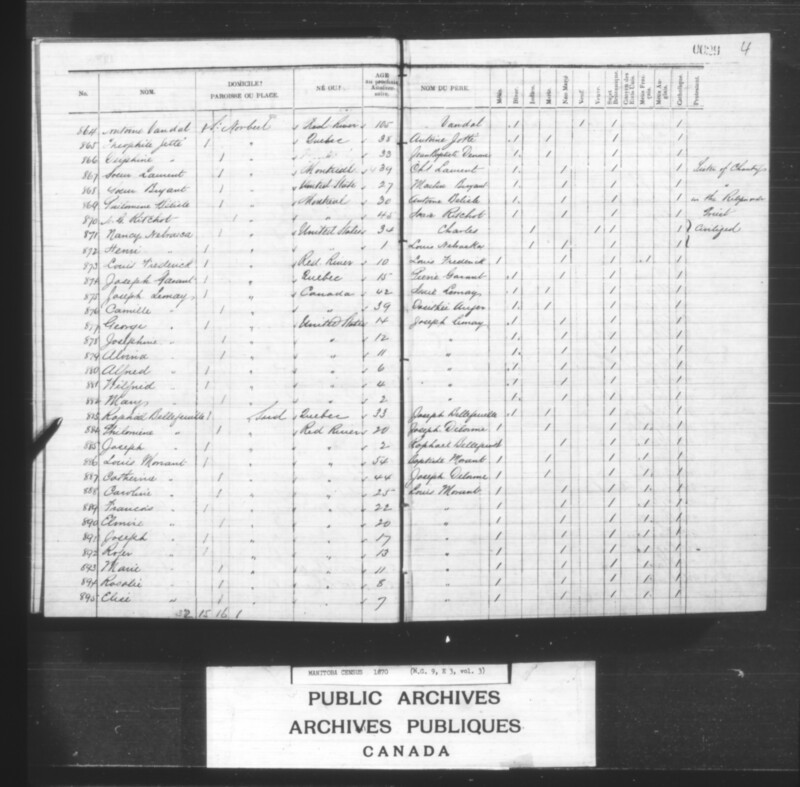 – [673-675] Marie 11, Alfred 6, William 2.
possibly resided at St. Boniface to 1872? – [1394-1398] Rosalie 29, Francois 21, Joseph 18, Elzear 14, Bernard 11. – [1423-1426] Marie Delphine 5, Francois 4, Charles 3, Patrice 2. 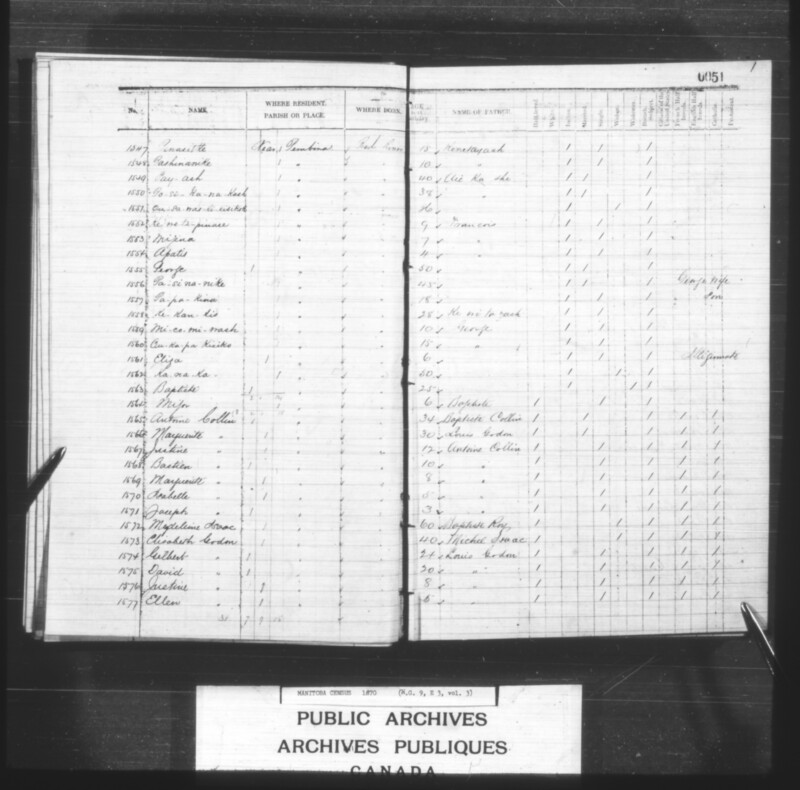 – [1417-1420] Alexandre 8, Michel 5, Marie R. 4, Rosalie 2. – [1411-1414] Marie 10, Virginie 8, Louis 5, Eleanor 1. – [1403-1408] Isadore 18, Michel 15, Joseph 13, William 11, Paul 9, Patrice 7. 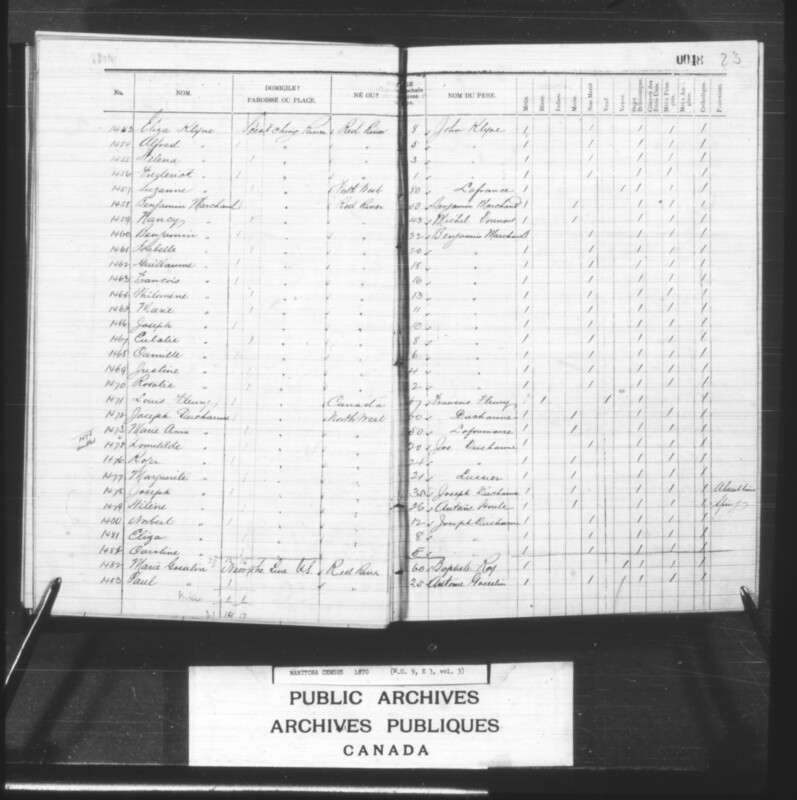 – [1872-1875] Isabelle 20, Celina 17, Marguerite 15, Roger 11. – [1381-1383] Narcisse 11, Marie A. 8, Marie 6, Josephte 3. – [1324-1325] Veronique 3, Joseph 1. – [1363-1364] Andre 2, Isadore 1. – [1367-1369] Napoleon 5, Patrice 3, Emilie 2. –  Alexandre 20,  Onesime 13. – [1354-1357] Joseph 8, Remie 5, Baptiste 4, Marie R. 2. – [1340-1346] Sophie 19, Elise 15, Joseph 12, Pierre 10, Alexandre 8, Melina 5, Julienne 2. – [1334-1337] Boniface 8, Patrice 7, Marie 5, Jean-Baptiste 3. –  Roger 8, [1329-1331] Marie 6, William 4, Pierre 1. – [1319-1321] Abraham 20, Rose 19, Sarah 15. 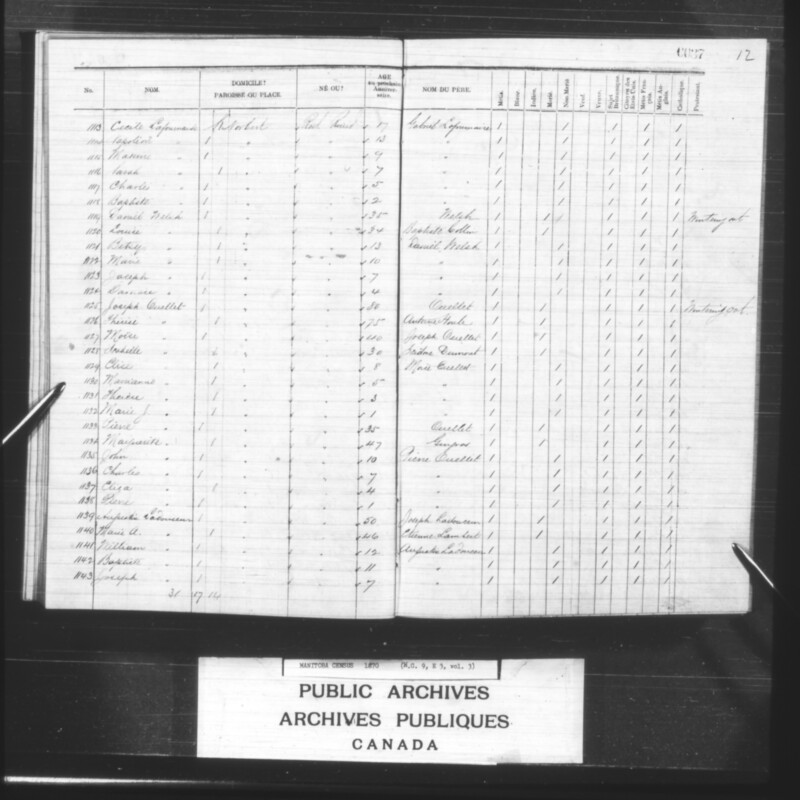 – [1311-1316] Marie 15, Josephine 13, Isabelle Cadotte 11 (daughter of Augustin Cadotte), Patrice 9, Eliza 2, Victoire 1. 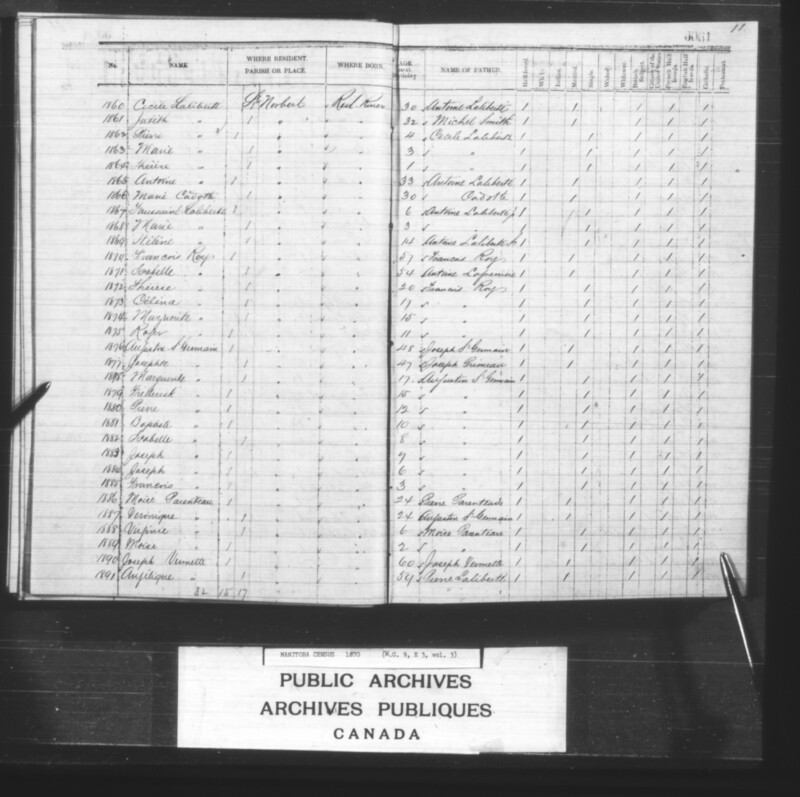 – [1301-1307] Norbert 19, Alexandre 16, Julien 14, Rosalie 12, Francois 8, Marie 6, Napoleon 3. – [1292-1297] Joseph 15, Marguerite 13, Edouard 11, Charles 8, Philomene 5, Marie 4,  Jean B. 1. – [1287-1289] Josephine 9, Roger 6, Rosalie 2. – [1273-1278] Pierre 13, Elise 11, Caroline 9, Louis 7, Veronique 4, Agathe 2. 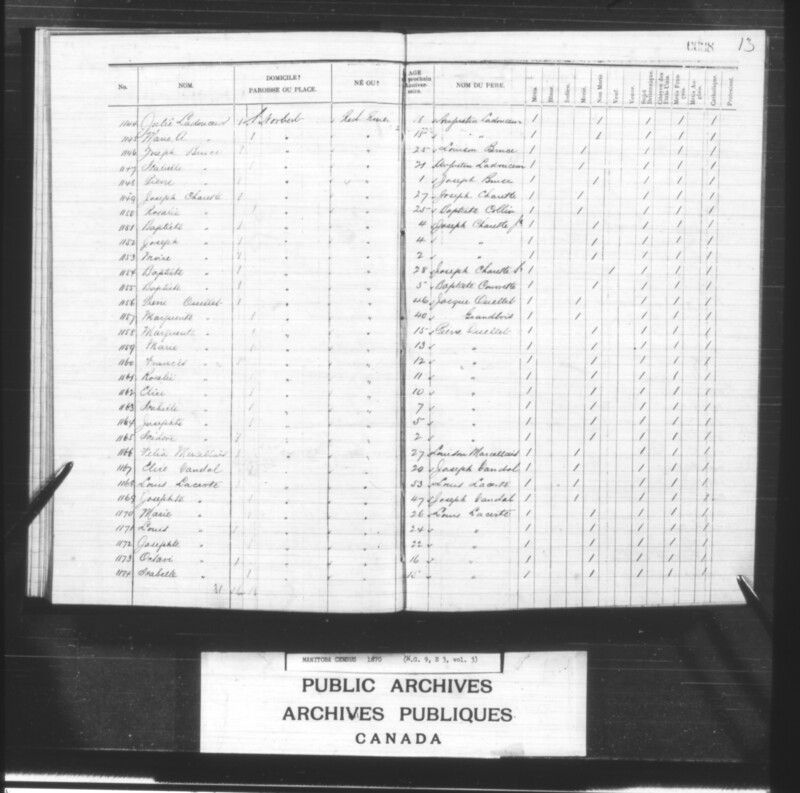 Either the father or son named Louis Lacerte could have been the honourable member of the Legislative Assembly of Assiniboia. 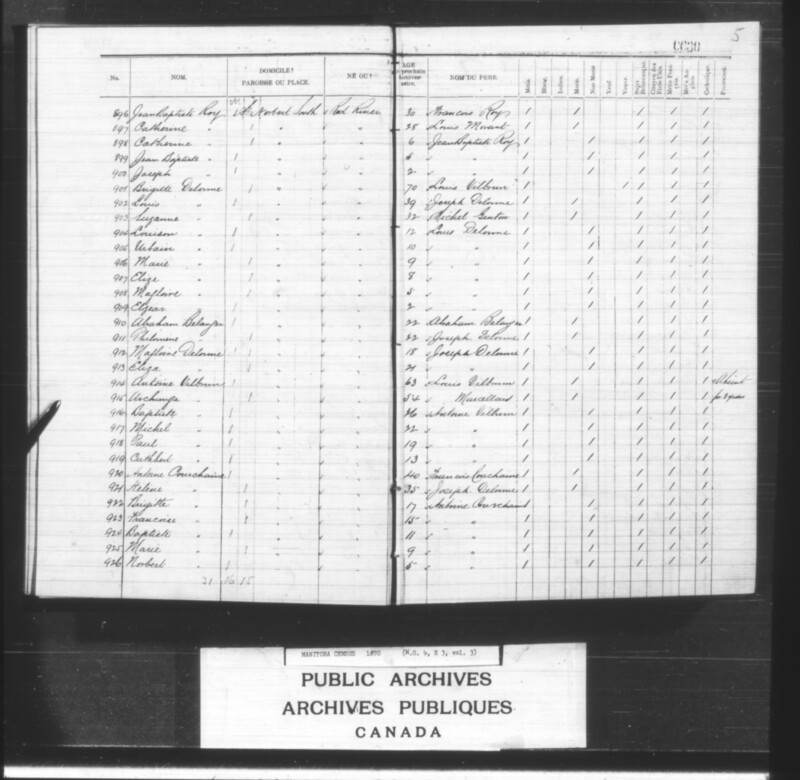 The son is perhaps a better candidate in that he was a property owner in Point-à-Grouette and conceivably resided there during the Resistance of 1869-1870. – [1349-1351] Marie 24, Jean 19, Joseph 10. – [1480-1482] Norbert 12, Eliza 8, Caroline 5. – [1460-1470] Benjamin 22, Isabelle 20, Guillaume 18, Francois 16, Philomene 13, Marie 11, Joseph 10, Eulalie 8, Camille 6, Justine 4, Rosalie 2. – [1451-1452] John G. 14, Edouard 9, [1453-1456] Eliza 8, Alfred 5, Helena 3, Frederick 1. – [1441-1444] Virginie 10, Toussaint 8, Roger 4, Philomene 1. – [1437-1439] Norbert 22, Elise 18, Francois 16. – [1429-1434] Nancy 10, Virginie 9, Marie 8, Frederick 6, Eliza 5, Julien 3. 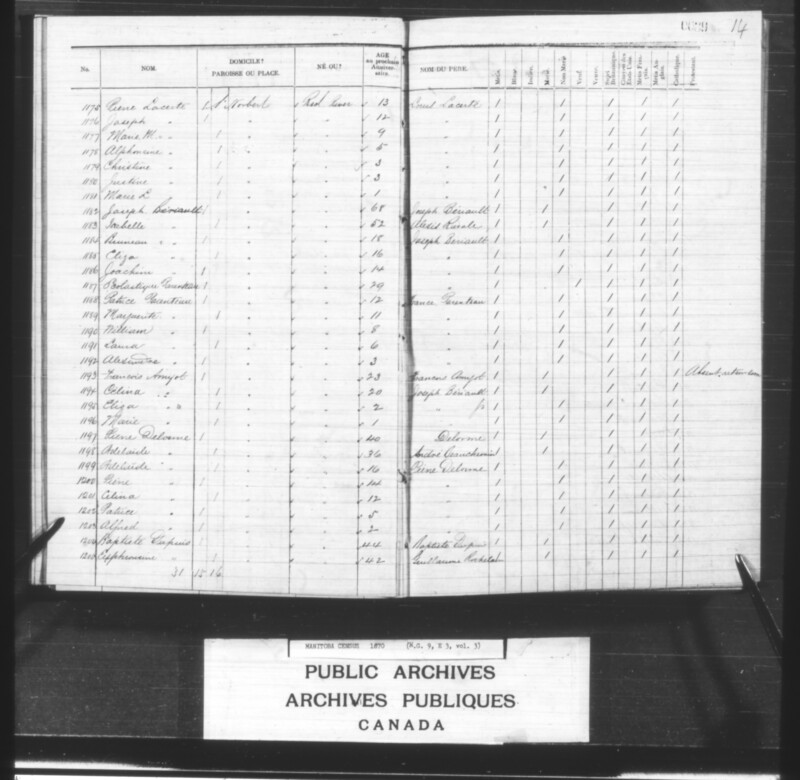 Baptiste (First Nations, born 1845) married and unidentified Métis woman. 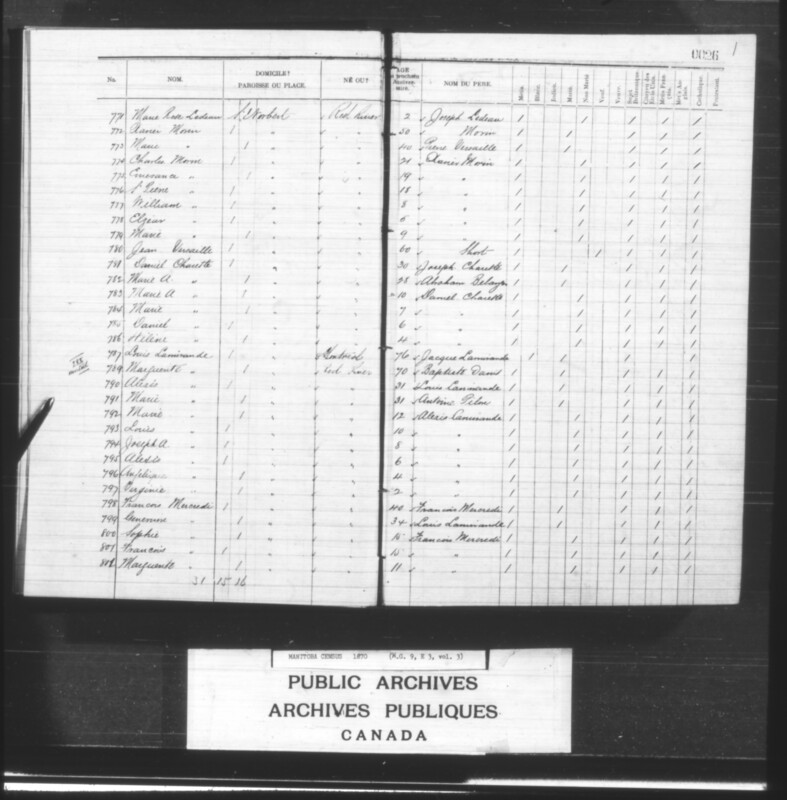 – [1559-1560] Ou-ka-pa Kisiko 15, Mi-co-mi-wash 10 (First Nations, children of George). 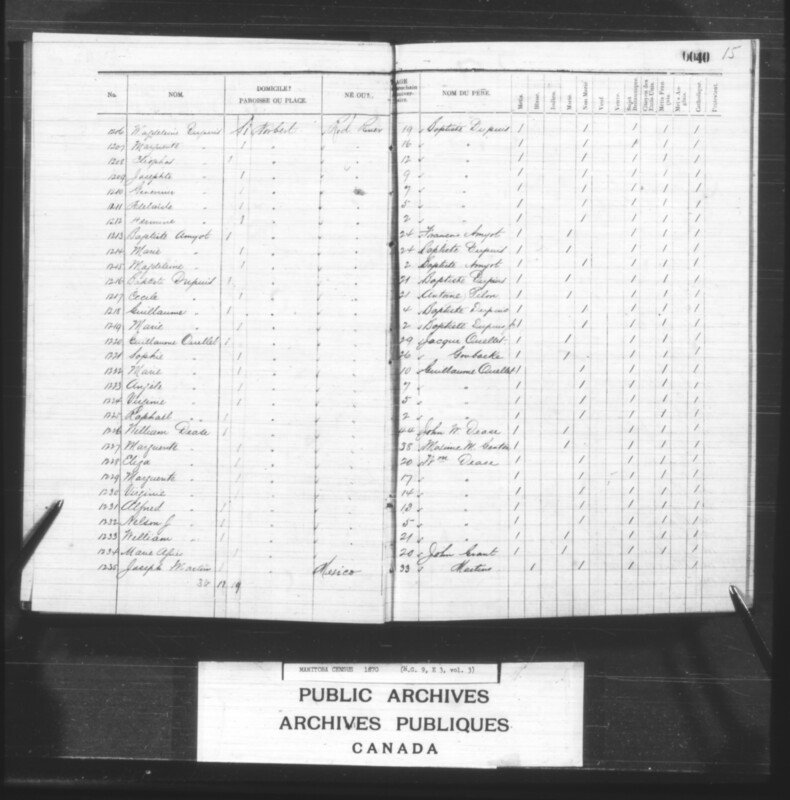 –  Eliza 6 (First Nations, parents unknown). – [1552-1554] Ke-me-ta-pinase 9, Mipina 7, Apatis 4. – [1545-1546] Ka-ka-pa-ye-sake 20, Ouikino 18, [1547-1548] Penasitke? 15, Pashinanike 10. – [1536-1537] Elzear 6, Josephte 1. – [1493-1496] Marie 9, Eliza 7, John 5, Marguerite 1. – [1502-1506] Marguerite 14, Rachel 12, Norbert 10, Francois 8, Patrice 5. –  Angelique 32,  Paul 25, [1484-1485] Augustin 23, Stanislas 21, [1487-1490] Charlotte 19, Nancy 13, William 11, Antoine 4. 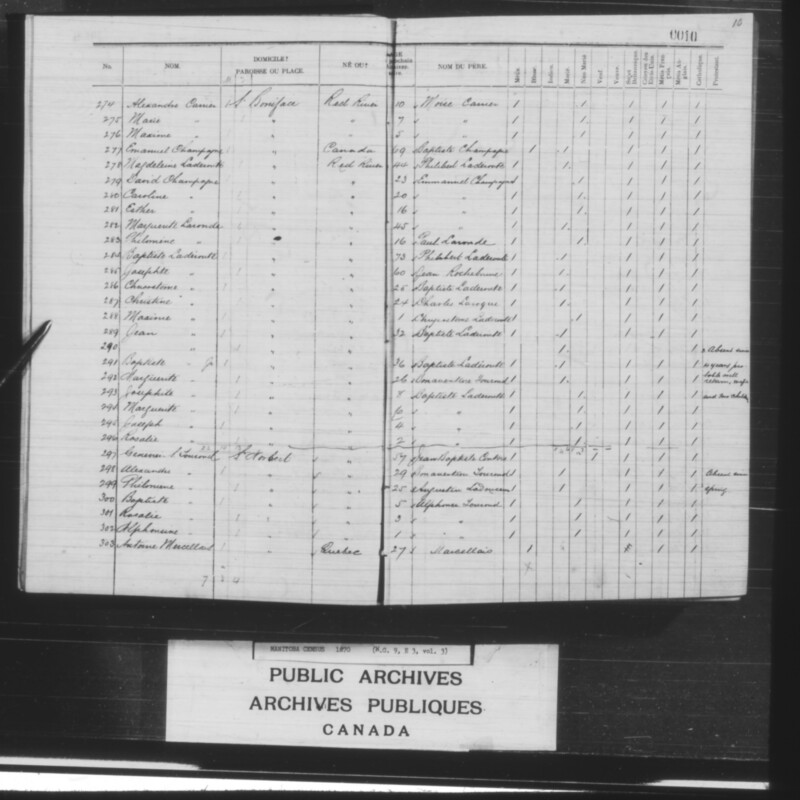 – [1574-1577] Gilbert 24, David 20, Justine 8, Ellen 6. See biography; but see also scrip and mother’s scrip. 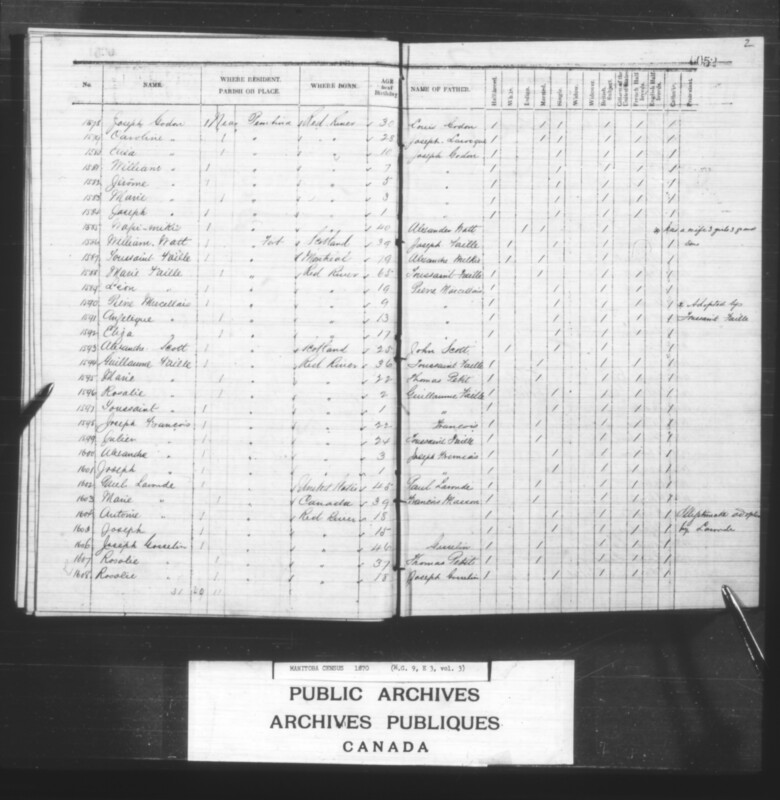 – [1567-1571] Justine 12, Bastien 10, Marguerite 8, Isabelle 5, Joseph 3. – [1541-1543] Sarah Manatat 10, Wawe-sa-cumikok 4, Wi-pi-chiause 1. – [1529-1532] Francois 27, Samuel 20, Joseph 9, Gilbert 6. – [1519-1527] Marie 23, Elise 21, Guillimine 19, Clemense 18, Octave 14, Solomon 10, Alphonsine 6, Caroline 3, Fancois 1. – [1513-1514] Adelaide 8, Caroline 6, [1515-1516] Jean Baptiste 4, Frederick 1. – [1509-1510] Rosalie 8, Louis 6. – [1596-1597] Rosalie 2, Toussaint 1. 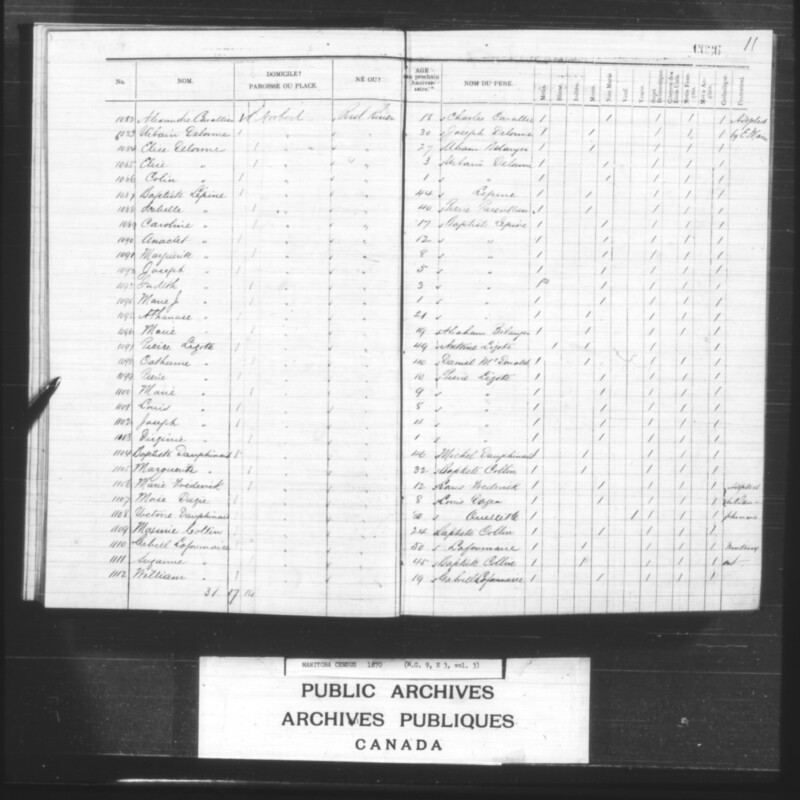 – [1590-1592] Eliza Marcellais 17, Angelique Marcellais 13, Pierre Marcellais 9 (Métis, children of Pierre Marcellais and an unidentified woman). – [1600-1601] Alexandre 3, Joseph 1. – [1604-1605] Antoine 18, Joseph 15. –  Rosalie 18, [1609-1615] Joseph 17, Alexandre 15, Marie 12, Eliza 10, Louis 8, Henri 5, Marguerite 2. – [1618-1624] Marguerite 15, Baptiste 14, Alexandre 13, Andre 12, Martin 11, Napoleon 3, Roger 1. 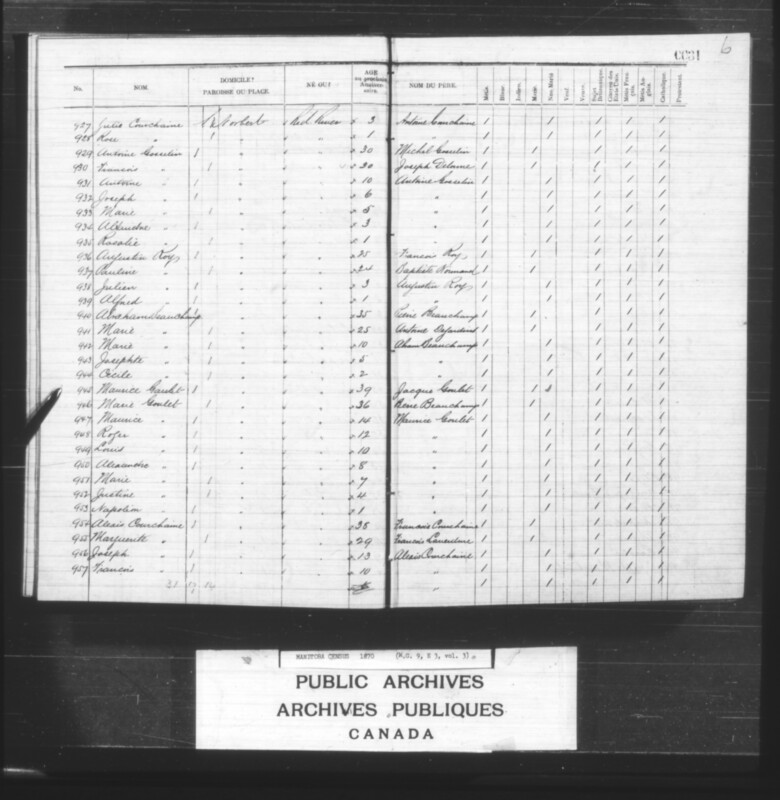 – [1580-1584] Elisa 10, William 7, Jerome 5, Marie 3, Joseph 1. No 49. Abkewance[? ], married to an unidentified woman. No. 121. Agahkookenais, married to an unidentified woman. No. 127. Ahbaynayahouhguet[?] (no description; absent?). No. 64. Ahingekehpoweke (no husband listed). No. 129. Ahkewesause, married to an unidentified woman. No. 66. Ahneoon (no wife listed). – 4 sons, 2 daughters. No. 32. Ahshawahpenais[? ], married to an unidentified woman. No. 149. Aindup (no husband listed). No. 28. Akeymonpenais, married to an unidentified woman. No. 18. Anewayweting, married to an unidentified woman. No. 126. Antoine, married to an unidentified woman. No. 94. (“widow of”) Ashahswope. No. 22. Ashaweshkoopensis, married to two unidentified woman. – 1 son, 3 daughters, and 1 other relative. No. 81. Ashengeekahpow (no wife listed). – 1 son, 1 other relative. No. 145. Assoneewahkameek, married to an unidentified woman. No. 69. 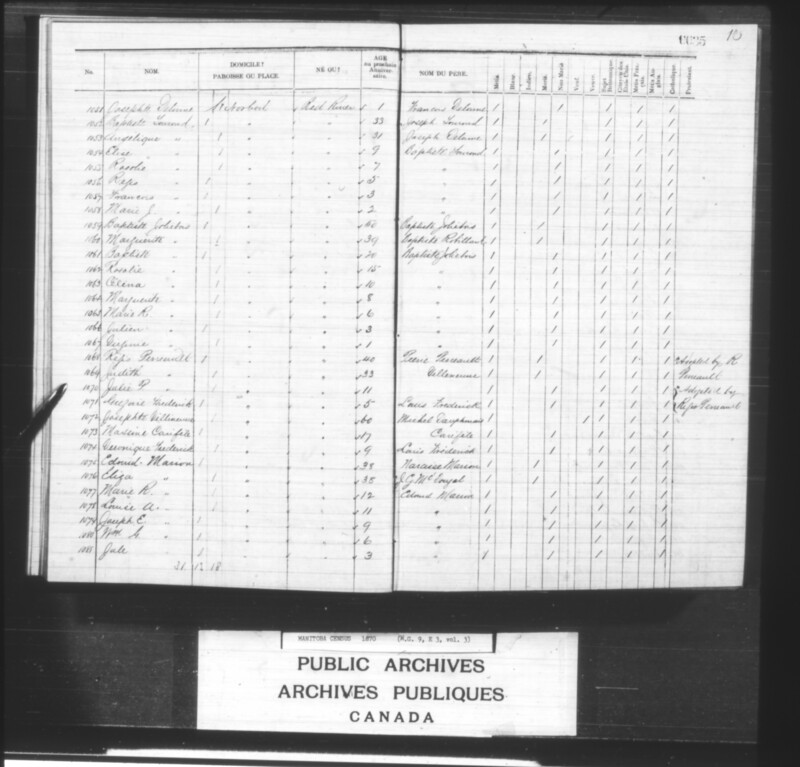 George Atkinson, married to an unidentified woman. No. 151. Baptiste “or, Ingekahpow” (no wife listed). No. 156. Baptiste Capelet, married to an unidentified woman. – 6 sons, 2 daughters. No. 141. Es-qua-ash (no description; absent?). No. 142. Etnawanagustook (no description; absent?). No. 12. Geesik (no description; absent?). No. 27. Gilchesabee, married to an unidentified woman. No. 96. Stanislaus Goslin, married to an unidentified woman. No. 99. Grasshopper, married to an unidentified woman. No. 155. Baptiste Hayden (no wife listed). No. 55. Kahgageesik (no description; absent?). No. 20. Kahgaquanayish[? ], married to an unidentified woman. No. 59. Kahkahommageewok (no description; absent?). No. 51. Kahkaksahpur (no description; absent?). No. 87. Kahkapayzash, married to an unidentified woman. No. 39. Kahkehpaskung (no description; absent?). No. 143. Kahmeetamenin, married to an unidentified woman. – 2 sons, 6 daughters. No. 75. Louis Kahneshkahtawesik (no description; absent?). No. 74. Kahpayzakseek[?] (no description; absent?). No. 84. “Kakahpaskung’s wife” [he is absent?]. No. 13. 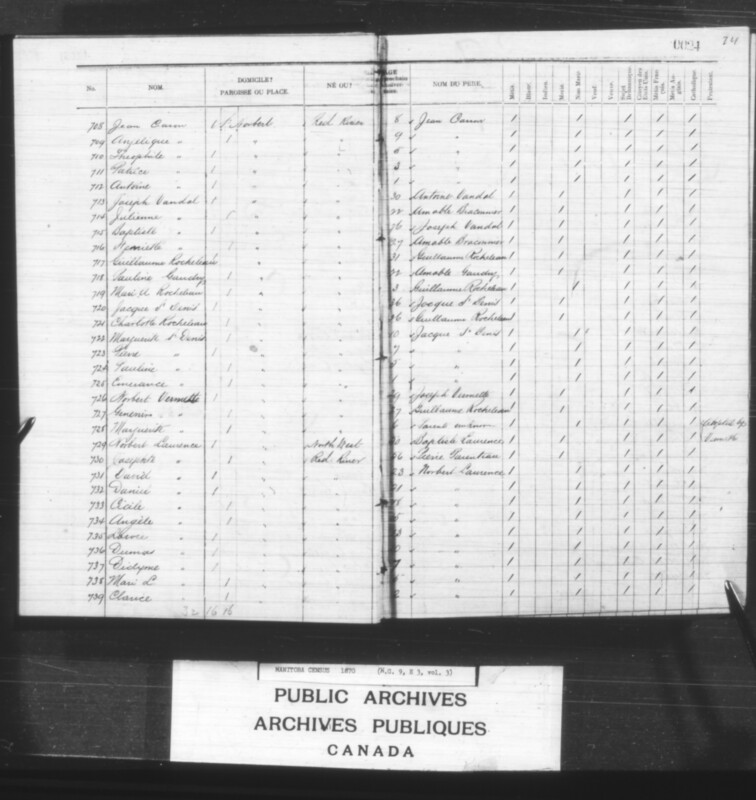 Kandwawageik, married to an unidentified woman. No. 47. Kapskapow (no description; absent?). No. 154. Kaymisbganis[?] (“from the States”). No. 103. Keewaytahgeeshik, married to an unidentified woman. No. 38. Kenowahpahmekut, married to an unidentified woman. No. 1. [Chief of Roseau River Anishinaabe in 1871, Signatory of Treaty 1] Kewetayah/ Ke-we-tay-ash/ ‘Flying Round’, married to an unidentified woman. No. 140. Kshkekayahshik, “wife of Paul” (absent?). No. 30. Machepenais, married to an unidentified woman. No. 17. Mamahtahkamekup[? ], married to an unidentified woman. No. 7. Manitopensis (no description; absent?). No. 35. Maquanuokshpoue[? ], married to an unidentified woman. No. 44. Manshtut, married to an unidentified woman. No. 132. Margaret (no description; absent?). No. 24. Masakayahbundung, married to an unidentified woman. No. 144. Maymahcheekahpow, married to an unidentified woman. No. 114. Maynoguneesh[? ], married to an unidentified woman. No. 14. Meekeensk, married to an unidentified woman. No. 108. Meenas, married to two unidentified women. No. 128. Meeneewahsik (“woman”; no other description; ansent?). No. 56. (“children of”) Memshwehkahonikook (no other description; absent?). No. 135. Meshahkekesik (no husband listed). No. 76. Meshakepenais, married to an unidentified woman. No. 137. Mesquawegeshikook, married to an unidentified woman. No. 26. Miskekappensis, married to an unidentified woman. No. 148. Miskobuk (no husband listed). No. 90. Muchekepenais, married to an unidentified woman. No. 105. Mukataguan[? ], married to an unidentified woman. No. 86. NahequayKahpowick (no husband listed). No. 104. Nahwahcumeekepeke (no description; absent?). No. 2. [Chief of Roseau Rapids Anishinaabe in 1871; Signatory to Treaty 1] Nanahwananin/ Na-na-wa-nawa/ ‘Centre of Bird’s Tail’, married to two unidentified women. No. 72. “2 grown children,” (1 son, 1 daughter) of Nanawansnan/ Nanawananam [immediately above]. No. 52. Naswahsope[?] (no description; absent?). No. 98. Natahweekahpow[?] (no description; absent?). No. 73. Natawash (no description; absent?). No. 138. NatchwaycummeKemmnoge[?] (no description; absent?). No. 97. Natummekekek, married to an unidentified woman. No. 8. Negoota, married to an unidentified woman. No. 9. Neeogesik (no description; absent?). No. 120. Negahusquaninig[?] (no description; absent?). No. 16. Netahwekakpow (deceased), married No. 15. Teetee (widow). No. 46. Nishmahchees (no husband listed). No. 107. Ojibway, married to an unidentified woman. No. 80. Okesechewahnook (no description; absent?). No. 71. Okeymonpenais, married to an unidentified woman. No. 112. Okeymowekahpow (no wife listed). No. 67. Oketshpeek (no wife listed). No. 109. Omenowayahshik, married to an unidentified woman. No. 122. Ookahpaycummekook (no description; absent?). No. 123. Oosahwekeeshekook (“widow,” but listed as having a husband). No. 102. Pagsahmekeeshequape[?] (no description; absent?). No. 93. Pahkoonaygeshik Jr., married to an unidentified woman. No. 5. Pahkoonsksik, married to two unidentified women. No. 34. Pahkwalchinineis, married to an unidentified woman. No. 31. Pahnahto Margainto (“wife of halfbreed”). No. 83. Papahmegeeshegowinin, married to an unidentified woman. No. 21. Pappetwawetung, married to an unidentified woman. No. 106. Pashahnewewenin, married to an unidentified woman. No. 33. Pashauga (no description; absent?). No. 88. Pashekkeesikook (no husband listed). No. 25. Patuvittagowinine[? ], married to an unidentified woman. No. 131. Penseswak[?] (no description; absent?). No. 117. Pokapahwegeshekook (no description; absent?). No. 118. Sahkahlaykeeshekook (no description; absent?). No. 150. Saypahmahgik (no husband listed). No. 29. Seence, married to an unidentified woman. No. 119. Seekabeguay (no description; absent?). No. 54. Shabbokamekeeskung, married to an unidentified woman. No. 134. Shahwimwaywayahaik[?] (no description; absent?). No. 10. Shawayzaso, married to an unidentified woman. No. 6. Sheshebause, married to an unidentified woman. No. 136. Shogganash, married to an unidentified woman. No. 153. Solomon, married to an unidentified woman. No. 130. Tatacummoose, married to an unidentified woman. No. 116. Tatahpashsheek (no wife listed). No. 115. 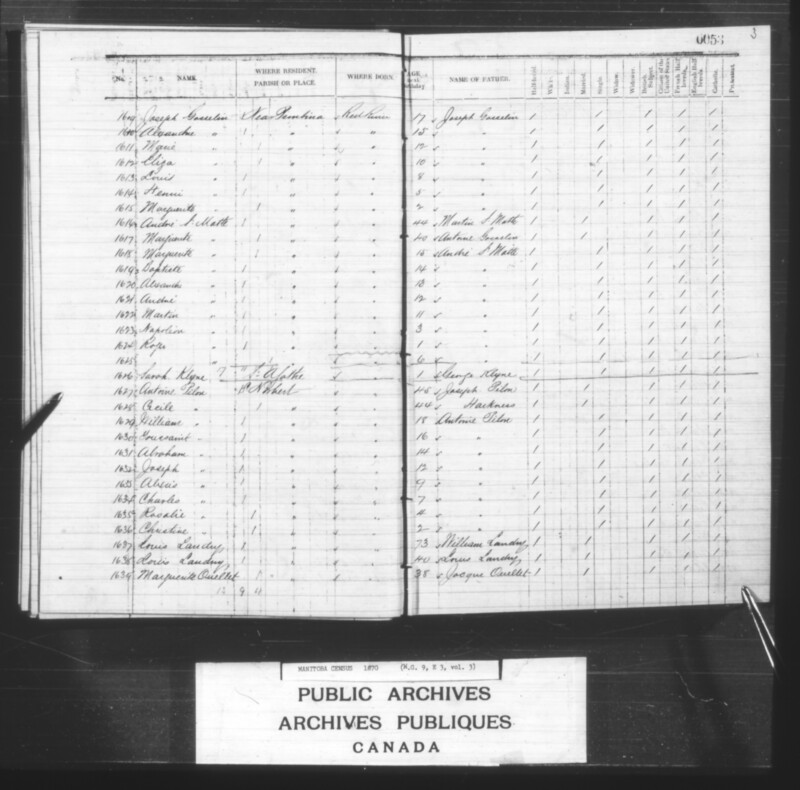 Taylepahhashpiw (no wife listed). No.19. Tepeshoogesik (no wife listed). No. 3. [Chief] Wahaoowash, married to an unidentified woman. No. 70. Wahpahnayahu[-]agustome[?] (no husband listed). No. 133. Wahpahnakeesheeskook (no husband listed). No. 43. Wahsagank, married to an unidentified woman. No. 4. Wahsuskoogunn, married to an unidentified woman. No. 82. Watuquape (no description; absent?). No. 23. Wasquance (no description; absent?). No. 92. Waymeeleegooshinse (no description; absent?). No. 152. Waytahmayquayhow (no husband listed). No. 95. Weeshk (no husband listed). Thanks Ron, I’ll update the entry.